Applications are invited from experienced retired Police Officers for filling up of 3 (Three) nos. 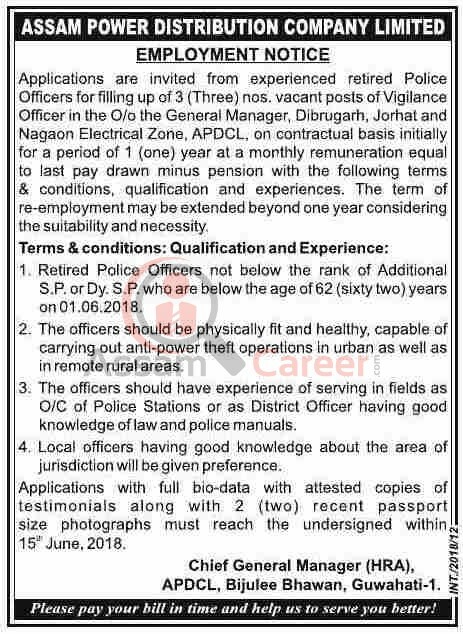 vacant posts of Vigilance Officer in the O/o the General Manager, Dibrugarh, Jorhat and Nagaon Electrical Zone, Assam Power Distribution Company Limited, APDCL, on contractual basis initially for a period of 1 (one) year at a monthly remuneration equal to last pay drawn minus pension with the following terms & conditions, qualification and experiences. The term of re-employment may be extended beyond one year considering the suitability and necessity. 1. Retired Police Officers not below the rank of Additional S.P. or Dy. S.P. who are below the age of 62 (sixty two) years on 01.06.2018. 2. The officers should be physically fit and healthy, capable of carrying out anti-power theft operations in urban as well as in remote rural areas. 3. The officers should have experience of serving in fields as 0/C of Police Stations or as District Officer having good knowledge of law and police manuals. 4. Local officers having good knowledge about the area of jurisdiction will be given preference. Applications with full bio-data with attested copies of testimonials along with 2 (two) recent passport size photographs must reach the undersigned within, 15th June, 2018.